Weighing a fully grown adult pig is not an easy task. Apart from needing to have gigantic scales you also need the co-operation of your large and independently-minded pig. But there is a simpler way and you can do it while your pig is standing still and eating his breakfast. Find a tape measure, or a piece of string that you can mark and then measure later. Place one end of the measuring tape at the base of your pig's ears and measure to the base of its tail. This is called the Length and can be tricky if your pig is very large or very wriggly! Then square the Heart Girth to get the Girth Result. You now have the weight of your pig in kilos. 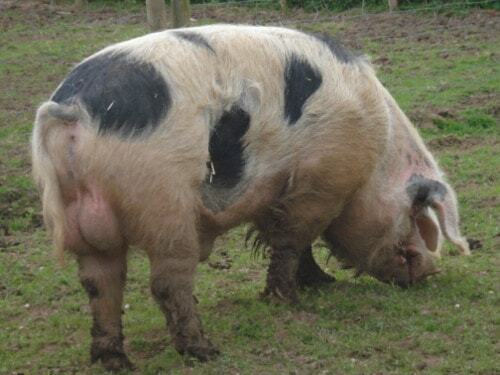 Your pig has a Heart Girth of 1.27 meters and a Length of 1.02 meters. To calculate its weight in pounds simply multiply the Girth Result by the Length and DIVIDE by 400. Your pig has a Heart Girth of 50 inches and a Length of 40 inches. This procedure is said to be accurate to within 3%.